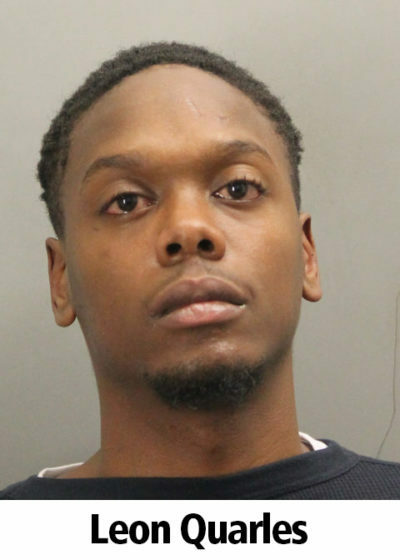 “MTPD arrested Leon Quarles, 23, of Washington, DC, on charges of felony assault following a violent and unprovoked attack on two innocent Metro customers at Navy Yard Station yesterday evening. At approximately 5:50 p.m. Tuesday, MTPD officers received a priority call for an assault in progress at the station. Upon arrival, officers found two victims — a 59-year-old female and a 39-year-old male – who had been attacked by the suspect. Officers were able to apprehend the resisting and non-compliant suspect on scene. The investigation revealed that the suspect, identified as Quarles, approached the female victim and, without warning or provocation, struck her in the head from behind, causing her to lose consciousness and fall to the floor. She was transported to a local hospital, where she was admitted for fractures to facial bones, lacerations and a concussion. The suspect then approached the male victim, also striking him in the head. The male victim was checked by EMS on scene, but declined further medical attention. The investigation also revealed that Quarles fare evaded at Navy Yard Station twice prior to the attacks. He had arrived at the station via train and exited the station by slipping through the emergency gate. He then entered a nearby CVS/Pharmacy where he allegedly shoplifted approximately $100 worth of merchandise before again fare evading into Navy Yard Station by squeezing through the ADA fare gate. Following his arrest, Quarles threatened to shoot two MTPD officers after his release. The stolen CVS merchandise was recovered by MTPD.